Frej is the first of the new-wave, Scandinavian-influenced restaurant in New York that really delivers on flavor and atmosphere — it is a pleasure for all the senses. Given the constraints facing the tiny operation, this is no mean feat. Hopefully they will be able to carry on in a permanent form in the longer-term. The two chefs — one raised in Sweden, one in Sydney, and both formerly of Corton — have come up with the perfect equation. The formula? It’s “5×2 = >$45,” meaning: they advertise five courses on their menu, but in reality you’ll likely get about ten dishes. Given the quality of the food, this is the most preposterously great value in tri-state fine dining you’re likely to find. But the $45 price of entry is only one of the reasons to go now. You see, now that they’ve finally been discovered and reviewed by the big boys, it will be even harder to snag a coveted seat at the seven-table, Monday-Wednesday night restaurant that is bookable only via email. But you owe it to yourself to try. The food and overall dining experience really is that good. If you had to label the food, you could call it New Yorkic™, as it combines the sensibilities of New Nordic cuisine with the produce of the New York area. 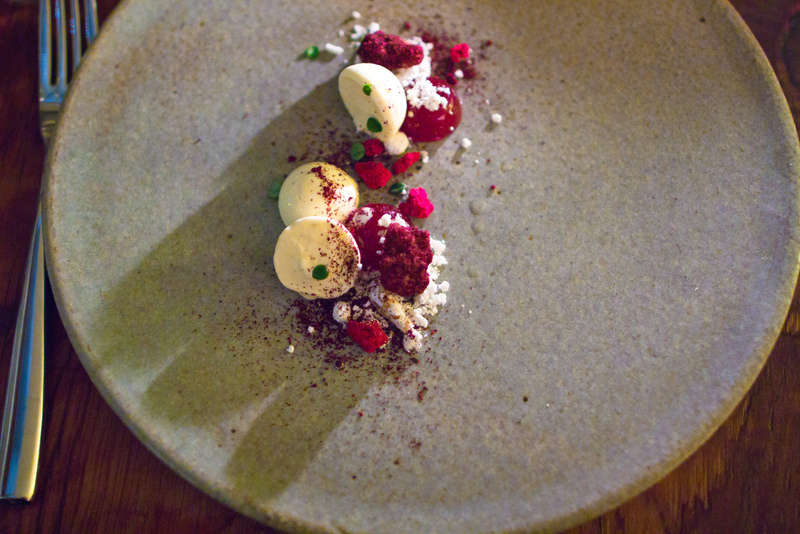 And, they were so taken with Jane Herold’s earthenware, they use it exclusively in the restaurant. Sure, it resembles the now oft-duplicated dinnerware of that Danish restaurant, but it’s handmade in New York. Just like the food. Operating out of a kitchen that is literally the size of your average closet, with very minimal equipment and no assistance in sight, these two chefs are cooking the food they like to eat and operating by their own rules. 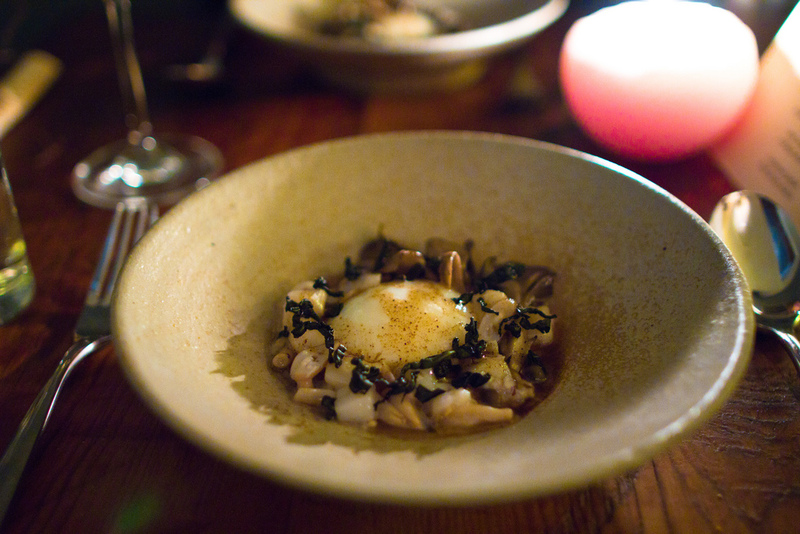 The result is subtle, yet intensely flavored dishes that are minimally plated but wholly memorable. But my favorite dishes of the night included one featuring the most translucent, sweet and succulent Maine shrimp I’ve tasted, a seriously divine fried veal sweetbread dish, with that trendy, orange-skinned Scandi rockstar (sea-buckthorn), padded out nicely with rosehip and miner’s lettuce. The cooking of the sweetbreads was perfectly judged, as were the textures surrounding it — something they pay very close attention to in their cooking. I was also enamored by a surprise dessert of (quite firm) goat milk custard that was flanked by seaweed shortbread crumbs, poached pear, allspice and crisped pear skin. It was one of the few savory desserts I have really savored. The reason nearly all of the dishes are triumphant is that the chefs use a small number of high-quality, local suppliers and only select the best ingredients. Here, ‘best’ does not mean the most expensive produce, but rather off-cuts of meat and under-loved vegetables from which they will be able to tease out new and complex flavors, and that won’t cost and arm and a leg (although, in some cases, it may actually be leg they’re after). Still, for $45 a meal (excluding drinks, tax and service), I’m not quite sure how they can be making any money out of what is essentially a ten-course tasting menu of seriously considered small plates. This is likely the reason that Frej is only a pop-up … at some point, someone will be smart enough to snag this duo’s dynamic food, and help them open a more traditional restaurant. Let’s just hope they are able to stay true to their vision and the roots they’ve now firmly planted. 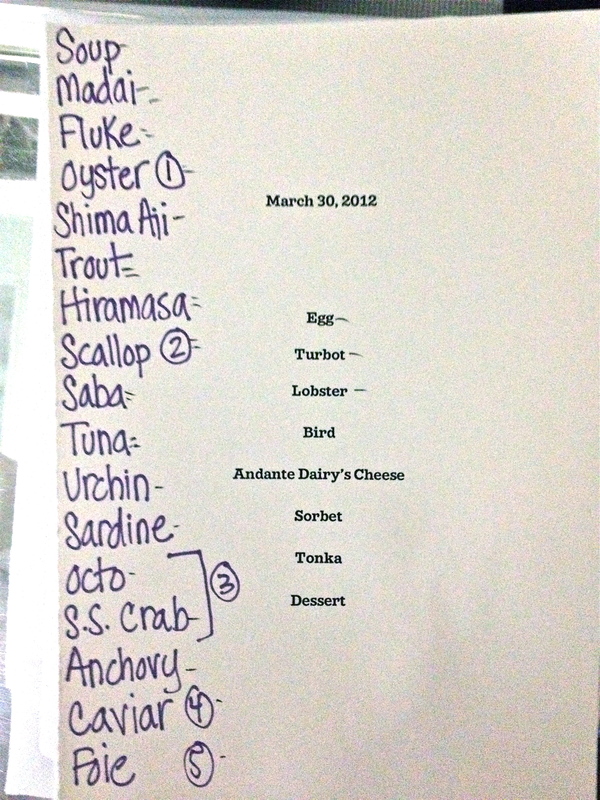 The list of all the dishes from my meal can be found below, and the current menu is available on their site. I don’t know if they always dish out two times what they promise, but if you happen to get a reservation, hopefully you’ll get lucky twice. A word to the wine: they stock a full bar, and have a nice, concise wine list consisting of about ten versatile wines that pair nicely with a variety of flavors and range in price between $29-$49/bottle. We had a $39/bottle Loire red blend of Pineau d’Aunis and Gamay (called ‘Poivre et Sel’ from Olivier Lemasson), which was very pleasant for the duration of the meal. Photo credit: all photos are courtesy of Spanish Hipster (thank you). Menus: There is only one menu available, a 20-plus-course tasting menu, which at the time of our meal was $225/person, excluding, tax, tip and drinks. of the diners on any given night. If you have an opportunity to go, don’t hesitate for an instant. “That might just be the best meal I’ve ever had,” all of us were saying in our own way, the realization slowly creeping up on us, as we stepped back onto the nondescript downtown Brooklyn street after a staggering 3-hour performance. I had tried to find the entrance to this holy grail of food fashionistas from inside the adjoining neighborhood supermarket … to no avail. My brother had, of course, realized that there was a separate entrance a few doors down. 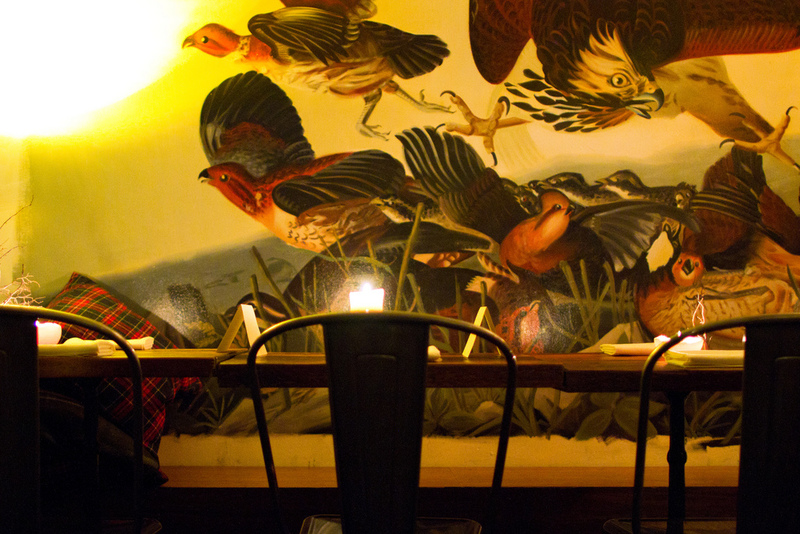 We were early, eager and — after peaking through the window of what is essentially an open kitchen with a D-shaped zinc bar for patrons to sit at on metallic stools — just a little nervous. We still had about twenty minutes to kill. We stood outside; it was freezing. We tried the covered, heated area just outside the entrance; it was too warm. Eventually we put aside our fears (of disturbing the chefs’ prep-work) and decided to enter. The one word that came to my mind during the first hour or so of sitting in this temple to pristine produce was ‘cold’ (despite the under-bar heating system pumping out way too much warm air). There was just something sterile about the place. It was, as Björk would say, “Oh so quiet.” There was little (if any) audible conversation between the chefs, or with their leader. And the chefs certainly didn’t say anything to us … much less acknowledge our existence. Which was weird. After all, it had not been such an insignificant feat to get here. Dual-phone re-dialing weeks ahead (during a conference call! ), prepayment for the entire food costs (not an insignificant sum for four people) a week in advance, the receipt of emails explicitly telling us what we may and may not do at the meal, and what we may and may not wear to this exclusive rendezvous. I do have to say that the room is exquisite it its own way, though. It’s pretty much a perfect reflection of the ethos of the chef and his cuisine. No expense spared, seemingly simple, nothing a hair out-of-place. And you can’t help but dig the wine display cases. But what of the food, you say? Well, as you probably know, there are no photos allowed, so I won’t be able to show it to you. And, given the sheer number of courses and ingredients, I won’t be able to explain each dish individually (you see, you are not allowed to take notes either … not that I ever do anyway). The 20-plus-course affair began with a succession of what were probably the freshest, most beautifully prepared, and harmonious bites of seafood that I have ever had the pleasure of eating. The chef was kind enough to email me a picture of the ‘menu’ from his iPhone just as we left the restaurant, so you can see the main ingredients below, although it leaves much to the imagination (probably a good thing — no spoilers). Each of the amuses was more or less a perfect composition — of art, of texture, of taste. Every time a new precious morsel arrived, it was immediately declared our new favorite, nearly every time. But it was still oh so quiet. We were each having our own little foodgasms inside our own little worlds, occasionally looking to our sides to confirm how mind-blowing whatever it was we just ate had been. It was mostly an internal dialogue, spoken in an atmosphere that seemed to call for reverence. There is a very good explanation for why the seafood is really that good. 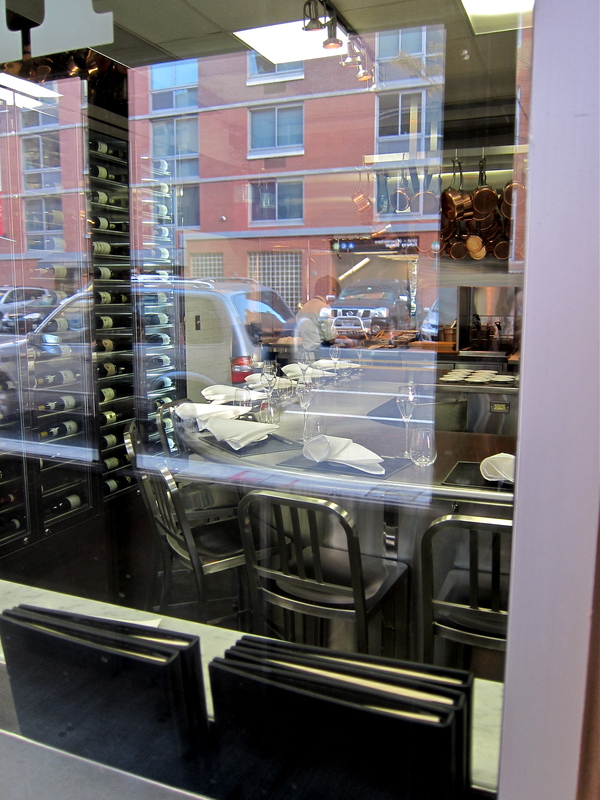 You see, the adjoining Brooklyn Fare supermarket bankrolls the Chef’s Table. César explained after the meal that he essentially has an unlimited budget to get what he considers to be the best ingredients from anywhere in the world via the quickest shipping methods available. That is the most important thing to him: he must have the best ingredients. So the (mostly) raw seafood in our dishes was probably on par with what the diners in some of Japan’s top fish-centric restaurants were eating that very day (it seems that much of the seafood comes courtesy of Japan’s famous fish markets). After mindfully consuming 10 or more of these minuscule masterclasses, I was kind of in shock. It was exactly what I had expected it to be, not far from perfection. But I still didn’t feel at home. None of us did. We felt exposed, disconnected from the people we had been staring at for the last hour. I consulted the helpful sommelier*, and found out that the ‘proper’ meal had not even yet begun. This did excite me: it meant there was a lot more to come. The rest of the bar stools had recently filled up too. There was more interaction amongst the diners, and with the big man himself too. People were asking him questions, and by George, he was beginning to answer them, to a degree. As if living out the Björk song in real life … “zing boom” … there was suddenly atmosphere, that most elusive of ingredients which help make a meal become truly memorable. As we ate — and ate — the mood lightened. Perhaps it was the wine, or perhaps this is the way it always is if you’re part of the Chef’s Table’s first seating, I don’t know. But we started flinging questions across the room to César and it seemed like he was beginning to enjoy the interaction a little bit more. Based on all the reviews I had read, I assumed that the savory portion of the meal would be at least 95% seafood, so I didn’t even contemplate any other types of dishes ahead of time. Maybe I had missed something, but in retrospect, I am rather glad nobody had bothered to inform me how good the non-pescatarian food would be. 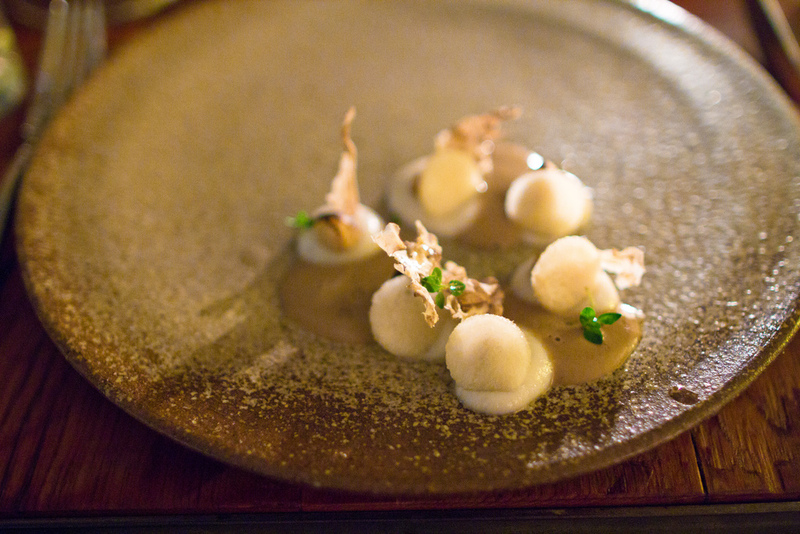 These dishes alone were worth a couple of Michelin stars. But the truly shocking thing was the desserts. I don’t think there is actually a pastry chef at the Chef’s Table, but if there is, he or she deserves to be recognized. These were some of the best I’ve ever had. For whatever reason, that set us over the edge. We were talking about gold well into the night — “I only eat gold,” “Oh you’re so low-class, how crass, I don’t eat gold, I only drink it,” and so on (for some reason, all adopting ridiculous British accents as we made our increasingly ludicrous proclamations). We were drunk, in every sense of the word. Drunk with drink, drunk with food, just perfectly drunk in the best way that drunk can be. So, what had begun as something unnervingly cold, kept improving, and eventually turned to gold. Though what I wrote at the beginning was true — none of us could find much fault with any of the food we’d been served and, in the end, it had become a fun meal too — strangely enough, I haven’t thought back that often about my meal at the Chef’s Table at Brooklyn Fare. 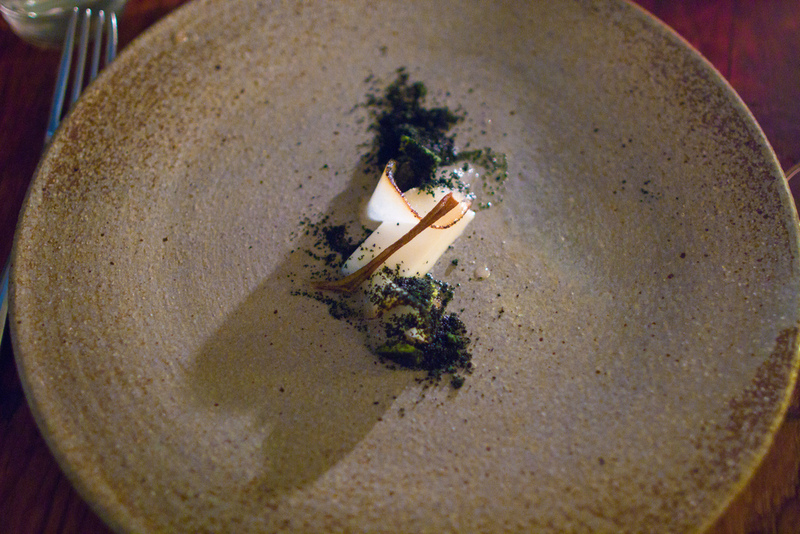 For some (as of yet) unknown reason, it just didn’t make as big an impression on me as some other restaurants have — say noma, for example. Part of this may be due to its location (which of course is not the restaurant’s fault). Because I live in the New York area, it is not a ‘destination’ restaurant I have to travel across oceans to visit, where English is not the first language. Such anticipation, and investment, can have a huge impact on your psyche. Despite my own lack of a certain nostalgia for the meal, you would be hard-pressed to find better food in New York City, the Tri-State area, and possibly the entire country. Sure, you might find a truly spectacular dish or two, here or there, that could hold its own with César’s cuisine … but likely not in such a measured procession and with such consistently wrought perfection. 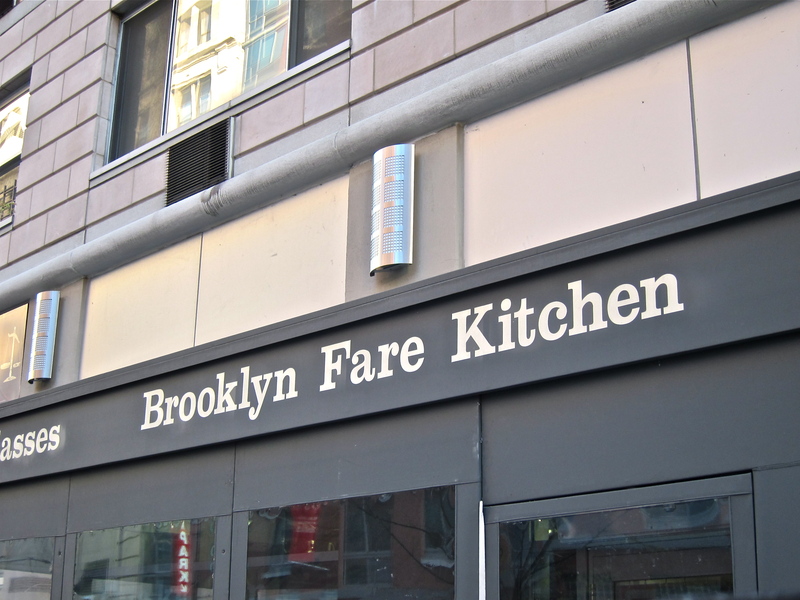 * The Chef’s Table at Brooklyn Fare was originally BYO-only. They recently got a full liquor license and now have a proper wine service. The wine list, from memory, is quite good, and there are some reasonable values from some of the lesser vaunted regions of France. We went through a lovely bottle of Champagne (Chiquet Blanc de Blancs Grand Cru d’Aÿ) for the amuse bouches, then an excellent white Burgundy (Jobard Meursault ‘En la Barre’), and a stunner of a Rhône red (Chave St. Joseph). It seemed more economical to drink three bottles rather than having them try to construct some type of pairing, which they didn’t seem to encourage. ***My brother and I shared this meal with Mathilde and David, and their account of the meal can be found here.